im about to pull the trigger on a 1980 MT 36,broker swears its a 36 as stated on the regstration,and the hin numbers match. 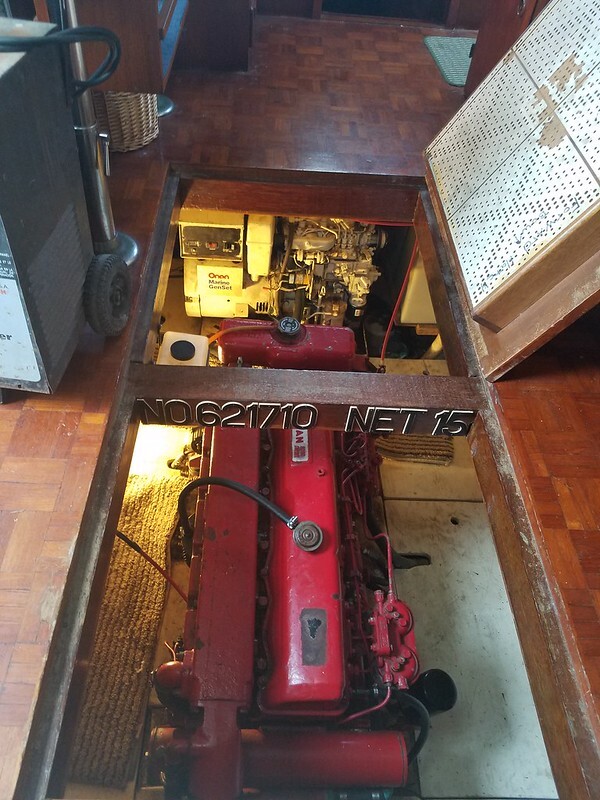 im new to trawlers,but i havent been able to find another MT 36 that looks like this one with the rear port side door,and long rear aft cabin. i have found the 1980 40 to be designed like this......but havent come across this in a 36 yet. its a queen aft berth,single lehman. i did read that marine trader used multiple hull builders,and its possible to have 2 marine traders of the same make n model to look different. alittle insight would be nice. 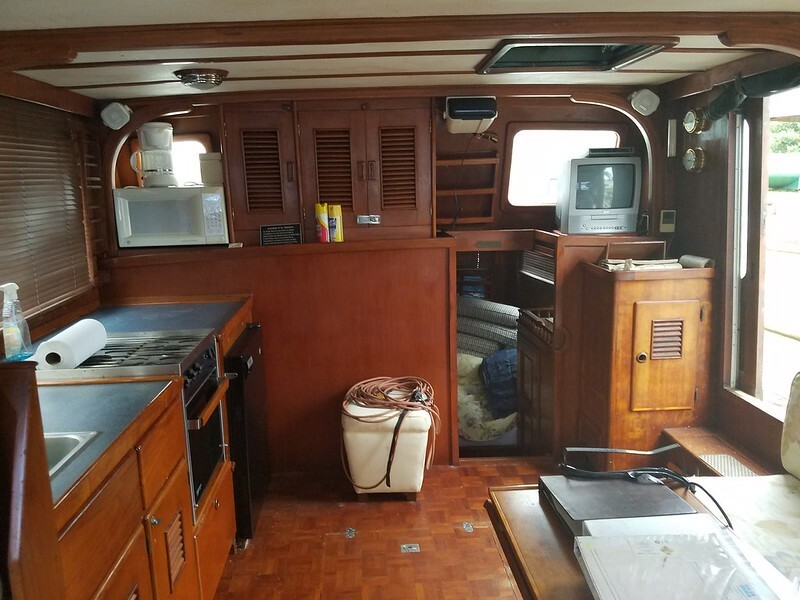 for that price im expecting rot,has the normal window leaks and original teak deck still installed. ive shared a few emails and he states the boat was never surveyed,but no soft spots anywhere. as stated my main concern is.....is this a 36,and not a 40 with 36 papers.its common in my area for folks to use papers for a different manufacture boat and try n pass off as a different boat. ive already bought a 1975 trojan 24,mths later i found out it was a 1980 stamos 24.....but all the numbers matched. some people will do anything to make a sale. 1980 36 Marine Trader Double Cabin. Two fuel tanks port/starboard totaling 300 gallons, boat is very efficient at 6-8knots and wide open might yield 10knots. Forward cabin has v-berth with hanging locker and small storage drawers and wet head. Small dingy with outboard go with the boat, being stored indoors but can take pictures if necessary. The rear mast/boom are used to load and unload dingy when boat is in use. Only thing I am of aware of not working is the power inverter, it was hooked up when we bought the boat but we don't use the boat without the generator running much so we just disconnected it. It may work if someone wanted to use it and played around with it. The biggest issue with it is that it's been sitting and hasn't been being used. It needs some TLC, cleaning, and general maintenance. Has some water damage below a few windows as was common for these boats. We will consider all offers, this needs to be sold!!! looks like a 36 to me. Look it up in the CG data base. The documentation numbers are visible in the photos. See what it says in the data base. Or get a tape measure and measure the boat. There are multiple layouts in Taiwan boats. looks like a match,and owners name is correct as the info i have. as suggested ill go measure it. when i compared to other 1980 MTs on boats.com,the rear deck on this one looks longer along with the rear side windows. but pics can be deceiving havent seen a another 36 to compare it too in person,only a few 34s. 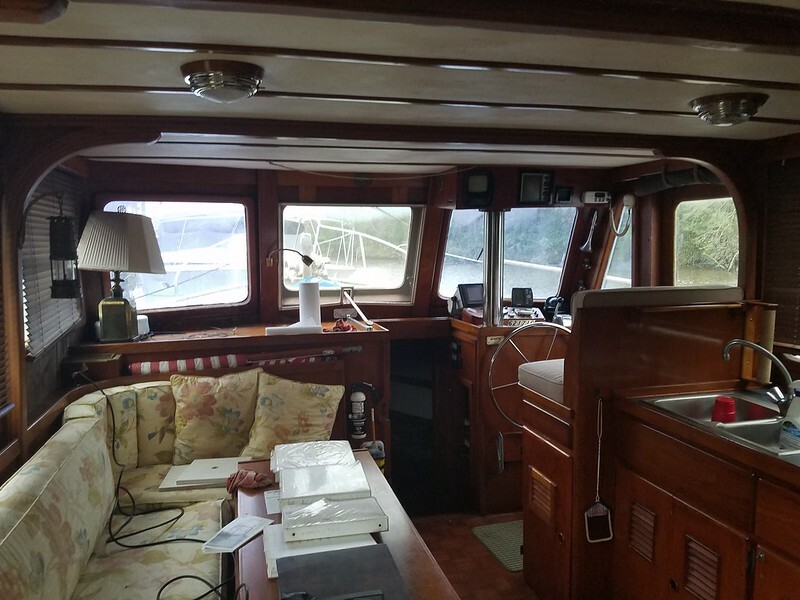 seller said from bow to stern at transom she was 43ish not counting swim platform. i was just being cautious,being price is so low for a boat that visually looks to be sound.and ive read there were many variations of these boats. ive also read that some 38-40s were tagged 36 to apeal to marinias on the east coast,as most only accomodate upto 36ft slip rental. in anycase ill go measure and get a closer look. im probably just confused after looking at over 30 boats in the past few mths,looks just like this 78 36,so many variants. i too noticed the hin (ETY372961079)starting with 37 and ending date code 1079,but i wasnt sure if there was a hin decoder on the marine traders. i wasnt able to go look at this boat fully,the owner wasnt available so i only looked at outside and didnt step aboard. but it seemed bigger than a 36,but i have never been near anything over 34 before asfar as trawlers go. and again owner states registration says 1980 36,it can be built in late 79 destined as a 80 model. The HIN or CIN you have entered meets the Straight-Year HIN format. It might also be a type that contains the country code and thus the boat comes from USA or Other . The serial number of the HIN is 37296 and is set by the boat builder. This boat or vessel has a Certification Date of (1979) and a Model Year of 1979 with month of build (October) based on the formatting of your hull_identification_number (HIN) . The manufacturer identification code (MIC) of your craft identification number (CIN or HIN) is ETY. This MIC (ETY) stands for the company name Marine Trading International which is currently In Business. 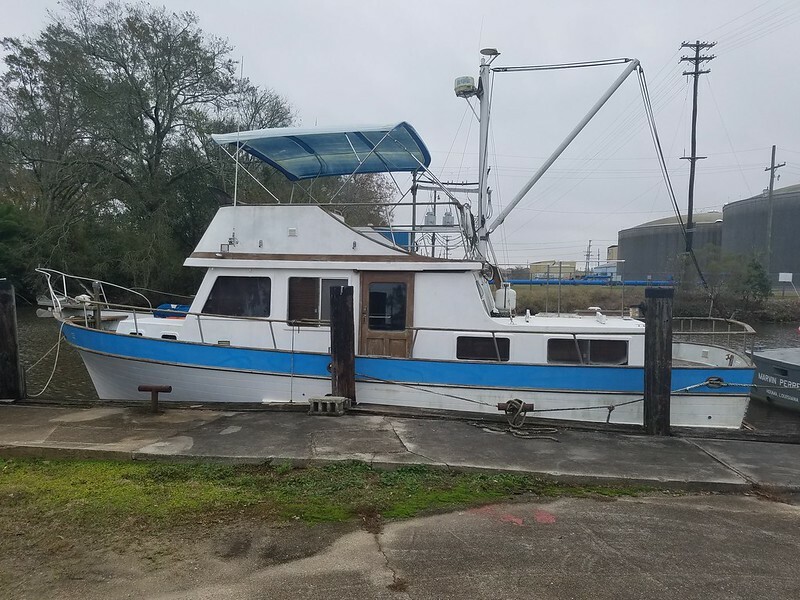 This boat manufacturer has other company names (ETY sometimes goes by these name(s) Eagle Trawler Yachts, Miller Yacht Sales Inc, Med Yachts International, or ). This company (Marine Trading International) is owned by Donald Miller and is located at Po Box 5300 in Toms River state of Nj. It manufactured this vessel and placed your HIN or CIN on the hull. The Parent Company for this boat maker is MILLER YACHT SALES (). Marine Trading International has started making boats, yachts and other watercraft as of 10/30/1972. The US Coast guard provides this comment about this watercraft manufacturer: Previous Address P.o. Box 1232, Pt. Pleasant, Nj, 08742. 12/27/2001 Update Per Rni. In the auto world, model year runs from about August to June of the following year. If a unit was built in October it would be the following model year. 10-79 = 1980 model year. Not sure if this is done in the marine world. My 1977 40ft double cabin has a HIN that starts with ETY40. It's pretty close to 40ft not counting the pulpit or the swim platform.